This Coconut Curry Grilled Chicken is a combination of two of my favorite meal types, grilling and Indian food. The marinade is out of this world! This Coconut Curry Grilled Chicken is one of my new favorite chicken marinades! We do a lot of grilling in the summer to keep the heat out of the house, but I have been craving Indian food! So I decided to combine grilling and the flavors of coconut curry and that is how this chicken was created. My favorite part is getting all the yummy flavor without all the calories! I actually created this while Echo was visiting, we are both crazy about Indian food, and we all LOVED this chicken! Echo requested that I get the recipe up soon so that she could make it again. We served this chicken with some kale salad and our yummy grilled artichokes. I made up a big batch of the chicken so that we would have some left over. I have been chopping it up in salads and wraps all week (it was perfect for our Chicken Salad Curry Wraps). When you make this chicken, be sure to make up the marinade with completely thawed chicken breasts, at least two hours ahead of when you will be serving it. The longer it has to marinate the better so that the chicken can soak up all the yummy flavors! Trim the excess fat off the chicken breasts then filet into two thin halves. Place chicken breast filets into a large ziploc bag. Add all marinade ingredients into a blender and blend until smooth, then pour over the chicken and seal the bag. Keep bag in the fridge at least 2 hours before serving so the chicken has a chance to soak in the flavors. Before grilling, let the bag sit at room temperature for 20 minutes before grilling. 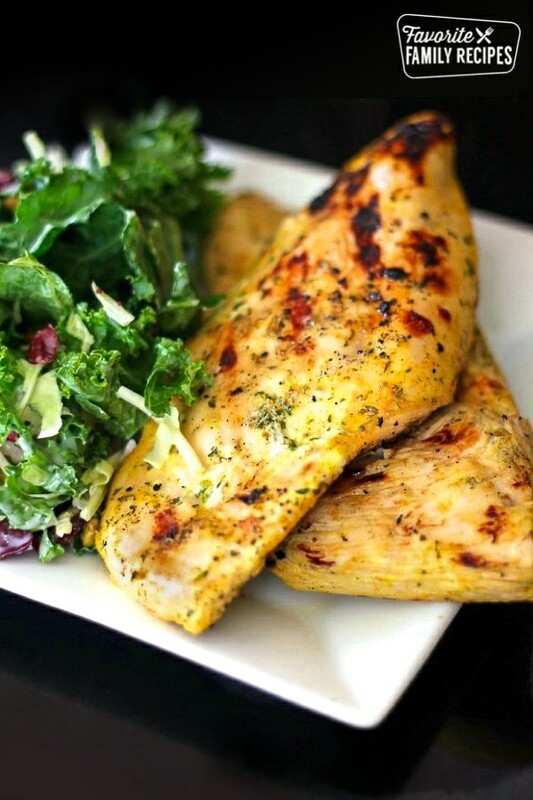 Place chicken filets on grill and discard excess marinade. Grill chicken over medium high heat until each side has nice grill marks and chicken is thoroughly cooked.